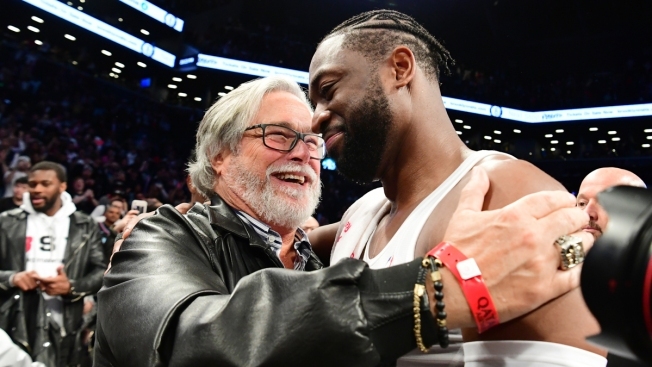 Dwyane Wade of the Miami Heat hugs Miami Heat owner Micky Arison after the game against the Brooklyn Nets at Barclays Center on April 10, 2019 in the Brooklyn borough of New York City. This was Wade's last NBA game before retirement. Dwyane Wade has gone full circle. "This city has allowed me to grow," Wade said. "I hope they're proud of what they have helped me become. So, this city means everything to me. It's forever, forever, forever going to be my home. This is the end of the basketball part of me, but there's so much I want to do in this city. So much more that we can accomplish together. I definitely look forward to that." The only certainty about next season for the Heat is that Wade's jersey will be retired. Even with Wade averaging 15 points and shooting a career-high 33 percent from 3-point range, the Heat couldn't make the playoffs. 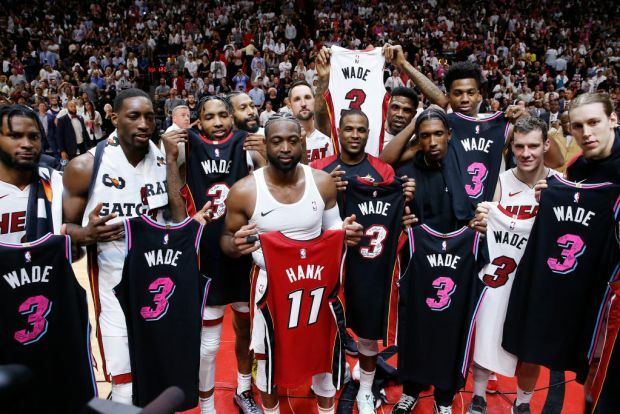 So with Wade leaving to become a fuller-time father and husband, how will Heat will get back to the postseason next year without him if they couldn't get there this year with him? "We're going to be there next year," Heat forward Justise Winslow insisted. The 'how?' part remains unclear. This will be a most interesting summer for Miami, which has virtually its entire roster from this season under contract for next season. Hassan Whiteside and Goran Dragic have player options to ponder; Whiteside wants to play more, and it seems unlikely that he'll wrest the starting center job back from Bam Adebayo. Dragic could be in position to get more years from Miami in exchange for taking less next year. Winslow is starting a new deal. Josh Richardson, James Johnson, Kelly Olynyk and Dion Waiters all remain under contract. These aren't small contracts, either, which means the Heat won't exactly be in a position of spending strength come free agency. The Heat want Udonis Haslem to return for a 17th season, primarily for his leadership. But there will be a glaring hole, on and off the floor, when Wade isn't there for the start of training camp. It was painful for Heat coach Erik Spoelstra when Wade left for Chicago, and this will hurt as well — albeit in a different way. "We'll get through it," Spoelstra said. "He's not going away this time. That was the part that was really hard (when) he was in another uniform. It just didn't look right, didn't feel right. It wasn't right. This, he's going to be a part of our family for the rest of the go at this. Whatever role that he figures out that he wants to do." Miami was 39-43 this season, though history suggests the Heat will bounce back next season. The Heat haven't had consecutive losing seasons since 2001-02 and 2002-03 — the ones that immediately preceded Wade's arrival. This will have to be a major area of improvement next season. Miami was the worst team in the NBA this season from the foul line, making only 69.5% of its attempts. It was the fourth-worst season from the line in Miami's 31-season history. Even though the Heat will always be defense-first under Spoelstra — it is a proven method in a Pat Riley organization — it's gotten simply too hard at times to win in this NBA when not reaching 100 points. The Heat were 4-20 this season when they didn't score 100, and 35-23 when they reached triple figures. Miami will have either the 12th, 13th or 14th best chance of winning the lottery. The Heat, Charlotte and Sacramento all finished 39-43 and a random draw will be held Friday afternoon at the Board of Governors' meeting to determine who will have what odds going into the May 14 draft lottery. If Miami keeps the pick, the Heat will have a top-14 pick for only the fourth time since drafting Wade 5th in 2003.